This post started as a serious essay on the cult of health among Asians, Koreans especially. After some research, I decided it would be better as an essay on endangered plants like wild ginseng that have been harvested to near extinction by overzealous Asians obsessed with the supposed health benefits. People like my parents often illegally searched for wild ginseng on protected parklands just to get their fix, never mind that it was becoming harder to find, never mind the future. Then I realized that this wasn’t fair, that every culture has its flaws, that taking care of the environment is a multi-faceted problem that obviously has its roots in the acts of every nation, ethnicity, and human being on our rapidly-dying planet dear God will our children live in a vast Sahara with only tumbleweed for food? WON’T SOMEBODY PLEASE THINK OF THE CHILDREN?! It wasn’t a very funny topic. So I was glad when I remembered that I (try to) write a humor blog, not a blog that makes people poke out their eyes in despair (I try). I’ll leave it to the rest of the Internet to provide you with your eye-poking needs. We might be running out of wild ginseng, but we are NOT running out of eye-poke sites. There’s a large jar of 20-year-old honey in my parents’ basement. 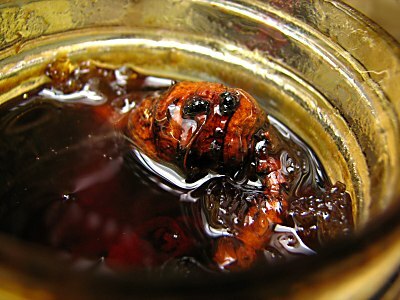 Gnarled, ancient roots of ginseng are buried in the honey, now hardened into nearly black crystals. It’s too valuable to eat. I think my mom planned to bequeath the jar to her future great-grandchildren with instructions to them to bequeath it to their future great-grandchildren. I expected her to argue and wring her hands over my daring to touch the sacred honey, but she didn’t. She ate it and she liked it. She really liked it. I think she’s secretly glad that she got sick and had an excuse to eat it. Maybe she was even faking being sick. She’s better now, but she keeps dipping into the jar. Ha ha ha. Screw the great-grandkids. Screw the children.